Paving stones are uprooted and water is tricking in and around — is the maintenance crew working on a leak? No. This is the new art installation on the roof of the Metropolitan Museum. The site is magnificent, nestled in Central Park and among magnificent New York skyline views, but this installation, which has no title, is dull. In the midst of it all, there’s a large, unworked boulder of Manhattan schist, the stone that forms the familiar outcroppings in Central Park, and supports Manhattan’s skyscrapers. 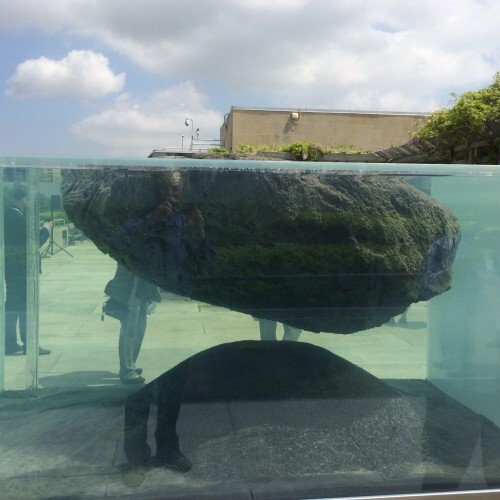 Some stone dust scattered around the boulder is said to have shaken off during the stone’s transport to the museum, and the artist chose to leave where it settles. The other major element is a large rectangular aquarium: inside it is a floating boulder of lava about the size of the schist boulder. Below that is a mound of sand with small swimming fish — lampreys, and tadpole shrimp we’re told in the written information accompanying the installation. One can think about contrasts: the unworked boulder contrasts with the worked paving stones. Schist is more dense than lava. The yearly change of roof installation contrasts with the relatively unchanging genetics of the fish. The inclusion of the accidental grit near the boulder to the roof recalls Marcel Duchamp’s incorporation of of accident — the glass cracked in transport — into his work of art, The Bridge Stripped Bare by Her Bachelors, Even (The Large Glass) about a century ag0 (click on live link to see it). He even incorporated the accumulated dust. What a wonderfully challenging work it is! Conceptual art focuses on thought. But there’s nothing in this roof top installation that enlarges thought. Nothing is shared with particular insight, let alone wit or irony. We might well have had something to enjoy in a more immediate, sensuous and inspiring sense. The Metropolitan Museum’s gorgeous roof installation of Cloud City by Tomas Saraceno three summers ago springs to mind — and other summer projects as well. What a disappointing way to treat a summer oasis! Better go downstairs and see Van Gogh: Irises and Roses. Pierre Huyghe’s roof garden installation will be on exhibit through November 1, 2015, weather permitting. For information on visiting the exhibition and on current exhibitions, click right here. Of all the roof exhibitions this is the nadir. The only saving grace is the view – which even this rather nonsensical exhibition cann’t diminish. Hope they do better next year – but do visit just see and enjoy the bird’s eye view of Central Park and environs. That’s a great work of art.